Treasury Secretary Jack Lew has warned that he US will hit its debt ceiling by October 17, leaving the government with half the money needed to pay its bills. Jack Lew said that unless the US is allowed to extend its borrowing limit, the country will be left with about $30 billion to meet its commitments. “Net expenditures on certain days can be as high as $60 billion,” he said. The US government and Republicans are at stalemate over extending the credit limit needed to avoid default. President Barack Obama and the Democrats have said they will not negotiate with Republicans over their demand that the government agrees budget cuts in return for backing a rise in the borrowing limit. 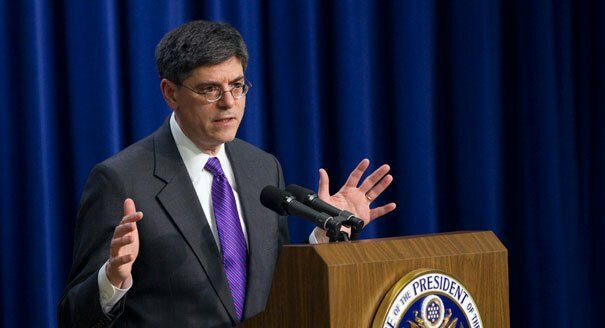 Jack Lew’s comments underline how close Washington is to running out of money. Failure to reach a deal would be “catastrophic” for the US economy, he said in a letter to House Speaker John Boehner. “Treasury now estimates that extraordinary measures will be exhausted no later than October 17. We estimate that, at that point, Treasury would have only approximately $30 billion to meet our country’s commitments. “If we have insufficient cash on hand, it would be impossible for the United States of America to meet all of its obligations for the first time in our history,” Jack Lew said. Jack Lew urged Congress to “act immediately” and increase the borrowing ceiling, which has been limited at $16.7 trillion since May. In return for supporting a rise in the ceiling, Republicans are pushing for a series of measures, including a delay by a year in the introduction of the Affordable Care Act, which would increase benefits under Barack Obama’s Medicare health programme. A spokesman for John Boehner said Jack Lew’s letter was a reminder of the need for an agreement to raise the ceiling while at the same time cutting US debt. Washington faced a similar impasse over its debt ceiling in 2011. Republicans and the Democrats only reached a compromise on the day the government’s ability to borrow money were due to run out. In his letter, Jack Lew reminded Congress that the 2011 battle “caused significant harm to the economy”. That fight was resolved just hours before the country could have defaulted on its debt, but nevertheless led to ratings agency Standard & Poor’s downgrading the US for the first time ever. The 2011 compromise included a series of automatic budget cuts known as the “sequester” which came into affect earlier this year.